IAG's interest in Norwegian Air was unexpected, but also not surprising. From nothing five years ago, Norwegian has built a 5% seat share on the North Atlantic, IAG's biggest long haul market. In response, IAG established Level, but an acquisition could rapidly accelerate its long haul low cost ambitions. It would extend IAG's leadership of the North Atlantic and make it Europe's biggest airline group overall. Norwegian is a long haul low cost pioneer, but IAG will be wary of Norwegian's two annual losses in the four full years since it launched long haul operations, and its growing debt burden. IAG may also be wary of Norwegian's increasingly unfocused business model, encompassing European short haul, trans-Atlantic and Europe-Asia long haul, a new Argentine domestic airline and aircraft leasing. Nevertheless, IAG says its 4.61% stake in Norwegian is "an attractive investment, …intended to establish a position from which to initiate discussions with Norwegian, including the possibility of a full offer". Norwegian said that it had not been in contact with IAG about this, but added that "interest from one of the largest international aviation groups demonstrates the sustainability and potential of our business model and global growth." Norwegian meanwhile appears coyly to have taken up the invitation to tango with IAG. Let the fun begin. One agenda item is entitled: "The cost equation: cutting costs and strategies for competing with low cost carriers"
IAG has acquired a 4.61% stake in Norwegian Air and Norwegian's shares jumped 47% on 12-Apr-2018. Norwegian plans ASK growth of 40% in 2018, driven by widebody operations. LCC seat share on routes between Europe and North America has grown from almost nothing five years ago to 8% in summer 2018. Norwegian entered the long haul market in 2013 with Boeing 787-8 operations across the Atlantic and to Bangkok, and added trans-Atlantic narrowbody services with Boeing 737MAX-8 aircraft in 2017. It has broken new ground strategically as the only independent European LCC with both single aisle and twin aisle operations, and by establishing operating subsidiaries in multiple jurisdictions. It is the biggest European operator of long haul flights originating outside its home country, entering the UK-US market in 2014 and subsequently adding long haul routes from France, Spain and Italy. Norwegian's expansion of its long haul model to launch routes from Barcelona in 2017 was a catalyst for IAG to launch its own long haul low cost brand, Level. Norwegian's innovation has prompted its local rival SAS to establish bases outside Scandinavia, and also encouraged Lufthansa to launch the long haul low cost operations of Eurowings. It also appears to have been a role model for Nordic LCC Primera Air's plans to launch trans-Atlantic low cost flights from London Stansted, Birmingham and Paris. However, Norwegian made a loss in 2014, which was its first full year after entering long haul markets. It returned to profit in 2015 and 2016, but slumped back into losses in 2017, when continued rapid expansion also further inflated its growing debt. Its net debt ballooned from NOK6.5 billion at the end of 2013 to NOK22.3 billion (USD2.7 billion) at the end of 2017. It is using sale and leasebacks to fund aircraft acquisition and also raised NOK1.3 billion in fresh equity in Mar-2018, but debt levels look set to continue to grow. CAPA's analysis of Norwegian's 2017 results noted that making a loss when the world's airline industry is enjoying a sustained period of historically high profitability had raised questions about Norwegian's ability to convert pioneering expansion into sustainable profitability. Even in good years, its margins have been modest. Norwegian expects better results in 2018, but its low (or negative) profit margins and high debt levels leave it exposed to any cyclical downturn or localised demand shock affecting its network, as well as to hikes in oil prices or interest rates. Little wonder that, before IAG's interest became public, Norwegian Air Shuttle ASA had long been the worst-performing share among bigger European airlines. Norwegian's shares jumped 47% on 12-Apr-2018, but the price at the end of 13-Apr-2018 was still 30% below its five year peak level of Apr-2016. 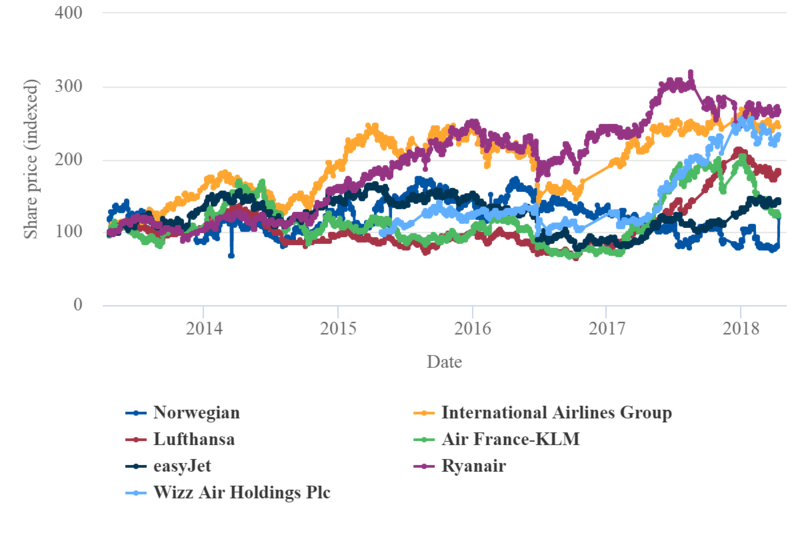 Over that same time frame, every other major European airline share has grown in value. Norwegian's poor share price performance has also made it more affordable as a possible acquisition target. Note: all indexed to 100 at 16-Apr-2013. Source: CAPA - Centre for Aviation and stock exchanges. Norwegian's trans-Atlantic network competes directly with nine routes operated by IAG subsidiaries on an airport pair basis, and with a further six on a city pair basis. The biggest overlap is with British Airways (10 competing routes in total), but it also overlaps with Iberia (two routes) and Level (three routes). Level operates from Barcelona to Boston, Buenos Aires, Los Angeles and Oakland. It plans to launch services from Paris Orly to Montreal and Pointe-à-Pitre (Guadeloupe) in Jul-2018, and to Fort de France (Martinique) and New York Newark in Sep-2018. Level has recently been given permission to operate routes between the EU and Canada. Norwegian, which has operated Paris CDG-New York JFK since Jul-2016, launched Paris Orly-Newark in Feb-2018. It also competes head to head with Level on Barcelona to Los Angeles and Oakland. The three overlapping routes account for almost one third (32%) of Level's seat capacity in late summer 2018, according to data from OAG for the week of 17-Sep-2018. Where else will you meet over a dozen airline CEOs at one event? Norwegian and British Airways compete directly on four of the 10 airport pairs that Norwegian operates from Gatwick (New York JFK, Orlando, Oakland and Fort Lauderdale) and BA competes on a city pair basis from Heathrow on the other six destinations (Los Angeles, Chicago, Boston, Seattle, Austin and Denver). In addition, BA also operates from Heathrow to New York JFK and from Heathrow to San Francisco (a competing airport to Oakland). BA plans to suspend Gatwick-Oakland this winter. Iberia and Norwegian compete on Madrid to Los Angeles and New York JFK. In addition to the 15 competing North Atlantic routes, BA and Norwegian compete on London-Singapore (operated by Norwegian from Gatwick and BA from Heathrow). Norwegian does not currently directly compete with IAG's Irish subsidiary, Aer Lingus. Nevertheless, the Irish-registered Norwegian Air International operates five North Atlantic routes from Dublin, Shannon and Cork, and two from Belfast. According to OAG, the exact proportion of Norwegian's capacity that is on long haul routes fluctuates according to the season. Moreover, it is growing as Norwegian expands long haul more rapidly than short/medium haul. Norwegian plans ASK growth of 40% in 2018, driven by widebody operations, which will be responsible for 70% of the additional ASKs. It can be calculated that widebody ASK growth is planned to be around 90%, versus 17% for narrowbody routes in 2018. From a standing start in 2013, widebody ASKs made up almost one third of the group's total in 2017 and will account for more than 40% in 2018. Narrowbody long haul operations will take this share even higher. The vast majority of Norwegian's long haul capacity is on the North Atlantic. According to OAG data for the week of 16-Apr-2018, routes to North America account for 94% of Norwegian's long haul capacity by seats and 91% by ASKs. Based on Norwegian's 2017 operating costs before other gains and losses and impairment charges, it can be calculated that its unit cost (cost per available seat km, CASK) is 26% lower than the average for IAG as a group, in spite of its having an average trip length 21% shorter than IAG's (all other things being equal, CASK increases as average trip length decreases). Norwegian's 2017 CASK is 14% lower than that of IAG's low cost airline, Vueling, but this is broadly consistent with Norwegian's longer average trip length. This analysis underlines Norwegian's credentials as a genuine low cost airline based on its CASK level (although it is not possible to differentiate between its long haul and short/medium haul CASK). IAG claims that its long haul low cost operation, Level, is genuinely low cost, but it is not possible to verify this from publicly available information. A recent CAPA analysis report highlighted the growth of low cost operators on the North Atlantic. Their growth has contributed to a reduction in the seat share controlled by the immunised joint ventures, of which IAG's British Airways and Iberia are members. LCC seat share on routes between Europe and North America has grown from almost nothing five years ago to 8% in summer 2018, higher than in any long haul market from Europe (LCCs have 1.0% on Europe-Asia Pacific, 1.7% on Europe-sub Saharan Africa and 3.4% on Europe-Latin America). With a seat share of 4.8% in calendar 2018 and 5.2% in summer 2018, Norwegian has led the LCC charge and is by far the leading LCC on the North Atlantic, based on current OAG data (this includes Norwegian Air Shuttle, Norwegian Air International and Norwegian Air UK). Its capacity this year will be nearly two thirds higher than last year (up by 64.1%). The North Atlantic is IAG's most important long haul region and the group is the leading operator in this market in the summer 2018 schedule, with 13.0% of seats. If IAG were to acquire Norwegian, this would give it close to 18% of capacity and further extend its lead over Lufthansa Group and Delta, both of whom have around 11% of seats this summer. The immunised joint venture within the oneworld alliance that consists of IAG's British Airways and Iberia, together with American Airlines and Finnair, has 19.9% of seats on the North Atlantic this summer. This puts it neck and neck with the JV within SkyTeam (Air France, KLM, Delta and Alitalia), which has 20.0%, but well behind the Star Alliance JV (Lufthansa, SWISS, Austrian, Brussels Airlines and United), which has 27.2% of seats. The planned addition of Virgin Atlantic to the Air France-KLM/Delta JV will take that alliance over 24% and leave the oneworld JV trailing the other two. Although it seems unlikely that Norwegian would join the IAG/American-led JV, at least initially, this further helps to explain IAG's interest in the LCC. According to data from Airport Coordination Limited, IAG airlines have a total of 23.6% of slots at Gatwick this summer (BA 19.0%, Vueling 2.8%, Aer Lingus 1.3%, and Iberia Express 0.5%). Norwegian, the airport's number three airline by seats, has 10.5% of slots. IAG and Norwegian together would have 33.6%, still behind leader easyJet's 43.3% share, but closing the gap significantly. After entering this market as recently as summer 2014, Norwegian overtook Virgin Atlantic as the biggest airline by seat capacity from London Gatwick to North America. Norwegian's growth out of Gatwick has prompted British Airways to grow its own North Atlantic operations from the airport, so that it will also be bigger than Virgin Atlantic in this market this summer. By contrast with Norwegian's, Level's North Atlantic network remains very small. By Sep-2018, when its planned new routes from Paris are up and running, Level will have five routes to North America, compared with Norwegian's 53. The North Atlantic will account for 54% of Level's seat capacity in the week of 17-Sep-2018 (source: OAG). Level's North American routes will consist of three from Barcelona (Boston, Los Angeles and Oakland) and two from Paris Orly (Montreal and New York Newark). According to OAG data for the week of 17-Sep-2018, Level will have 0.4% of all seats on the North Atlantic, compared with Norwegian's 5.4% share. Level will also take over the Paris Orly-Newark operations of BA's OpenSkies subsidiary from Sep-2018, but this will only add something like 0.1% to its North Atlantic seat share. Level withdrew from Barcelona-Punta Cana in Mar-2018, but will have three routes to Latin America in Sep-2018 (Paris Orly to Pointe-à-Pitre and Fort de France, and Barcelona to Buenos Aires), giving it 1.1% of seats between Europe and Latin America in the week of 17-Sep-2018. It is bigger in this market than Norwegian, whose seat share is only 0.4%, based on its London Gatwick-Buenos Aires route. Level was launched fairly quickly by IAG through the deployment of aircraft and crew wet leased from Iberia, using Iberia's code and AOC. Its Barcelona base will have three Airbus A330-200 aircraft by late summer 2018 and its Paris Orly base will have two of the same aircraft type. Level's A330-200s have 314 seats (293 economy and 21 premium economy), but Norwegian's widebody fleet may have a unit cost advantage, based on both the size of its aircraft and its use of newer-generation technology. Norwegian's most common widebody variant is the Boeing 787-9, with 338 seats (284 in economy and 54 in premium economy), while its 787-8s have 291 seats (259 economy, 19 business class and 13 premium economy). This analysis has focused on long haul operations, particularly the North Atlantic, since this is likely to be the main motivation for IAG's interest in Norwegian. However, Norwegian's significant pan-European narrowbody operations cannot be ignored, and IAG will have to consider the extent of Norwegian's fit with Vueling. At first sight, Norwegian's strength in Scandinavia, where Vueling is small, looks complementary to the network of IAG's LCC. Norwegian also has bases in Vueling's native Spain, where there would be some overlap, but their destinations are different to a large extent. Based on OAG data for the Aug-2018 seasonal peak, Vueling ranks third and Norwegian ranks fourth among LCCs by seats on routes within Europe – not far ahead of Lufthansa's Eurowings. A combination of the two would consolidate the third position, closing the gap to second-placed easyJet and opening up a considerable lead over Eurowings. In the past, IAG's approach on acquiring airlines has been to maintain them as distinct operations, but it might want to consider merging the two short/medium haul airlines to gain maximum synergies, subject to regulatory constraints. Looking at the share of all seats to/from/within Europe in summer 2018, data from OAG show that Lufthansa Group is the biggest in Europe, with 12.2% of seats, followed by Ryanair, with 10.3%, and IAG, with 9.3%. Norwegian, in eighth place, has 3.0% of seats this summer. Based on these figures, a combination of IAG and Norwegian would jump to the top of the rankings, just, with a seat share of 12.3%. It would also take IAG to the top of the rankings of European airline groups by passenger numbers, based on 2017 data. The combination of IAG (104.8 million passengers) and Norwegian (33.2 million) would have 138 million passengers – ahead of Lufthansa Group (130.0 million) and Ryanair (128.8 million). If IAG were to acquire Norwegian, and this is still very much a question of 'if', IAG would gain a much bigger low cost long haul presence on the North Atlantic than it could just by growing Level. IAG could also considerably strengthen its short/medium haul low cost presence and provide a stronger challenge to Ryanair and easyJet across Europe. From a competition standpoint, there could be regulatory hurdles on any routes where the concentration resulting from any acquisition was deemed too great, but second-guessing regulators is never easy. The bigger question marks would seem to surround the financial performance of Norwegian. IAG is the most profitable legacy airline group in Europe and the third most profitable of all airline groups in Europe, behind only Ryanair and Wizz Air on operating margin. IAG has the financial resources to buy Norwegian, but all of IAG's airlines are expected to meet its return on invested capital target. It might therefore be expected to show discipline in only proceeding with a deal to buy Norwegian if it judged that it could significantly improve its results. Such an analysis would include cost synergies from the removal of overhead duplication and network rationalisation where strategically sensible; in addition to revenue synergies from network complementarity, traffic feed and joint marketing. IAG would probably also want to sharpen Norwegian's focus. In addition to the European short haul business and the North Atlantic-led long haul business, Norwegian has a fledgling Argentine domestic operation due to take to the skies in 2Q2018 and an aircraft leasing business to place aircraft ordered but not needed by the group. These are all different businesses with different challenges and Norwegian's opportunistic approach may not have served its profitability well. IAG would also have to consider the impact of Norwegian's various activities on its existing businesses and brand positioning. There is much work to be done before IAG can make a decision. Moreover, Norwegian needs to reciprocate IAG's interest. CEO Bjorn Kjos, who owns a significant stake in Norwegian, has said that he has not considered selling, but he flattered IAG as a "professional airline" with "very decent people". Mr Kjos needs to keep the door open to such a deal, given Norwegian's losses and mounting debt. It is early days, but this is a flirtation that could build.